Making and flying model rockets is a fun hobby that is surprisingly inexpensive to do. The great thing about model rockets is that the hobby comes in two parts. First, you get to make your flying model rocket and then you get to invite your friends and family to watch the big launch! If you are new to model rockets, here’s a brief guide to what’s involved in the fascinating and exciting hobby of making and flying model rockets. You don’t need to have a lot of materials and specialist tools to start building your own flying rockets; there are plenty of model rocketkits that come complete with all you need. Flying rocket model kits include all the parts, including the launch pad and the rocket engines and, of course, the instructions that will tell you how to build your model rocket. All you really need is a craft knife, some glue, and some of your time. The basic components of a model rocket are a cardboard tube, balsa wood or plastic fins, a nose cone and a parachute. To that, you will add a rocket engine, which will provide the propulsion for your rocket. There is then usually a second charge that blows the nose cone off the end of the rocket to allow the parachute to deploy so that your rocket can come safely back to earth again. How do you ignite the rocket engine? The rocket engine is fired off by an igniter that you connect to a battery. Model rocket igniters work very much like the filament in a light bulb. When an electric current is passed through it, the igniter heats up and causes a flame that fires the rocket engine. Igniters are usually supplied with model rocket engines and the rocket launch controller is usually included with the rocket launch pad. When you are first starting out the model rocket hobby, it’s a good idea to begin with an all-inclusive model rocket kit. With these kits, you begin by assembling the rocket launching pad, which is relatively easy to do, because there are only a few parts, and they usually just snap together. The launch pad will come with a guide bar to keep the rocket straight as it takes off, and a metal base plate that deflects the exhaust from the rocket engine. The next stage is to assemble the rocket itself. The method of assembly will vary, but the basic process starts with attaching the fins to the body of the flying model rocket. You will then work on the engine mount, which can be the most challenging part of the construction process. You will then need to build the nose cone and the parachute assembly. Once you have completed that, you will be ready to paint your model rocket and decorate it with it with some stickers. With the modern model rocket kits, you can assemble a working flying rocket in just an hour or two, which is why it is such a great way to begin your rocket hobby journey. When you have completed your first model rocket, it’s time to call your friends and family and invite them to witness its maiden voyage! For your launch location, choose an open area that is free of any dry vegetation. Install your igniter into the rocket engine, place your rocket on the launch pad and attach your rocket launch controller. Then all you have to do is stand well back and take on the role of mission control with your rocket launch countdown! Constructing model rockets is not at all difficult to do and it’s nowhere near as expensive as you might have thought. You can buy all-inclusiverocket launch kits from as little as thirty dollars. 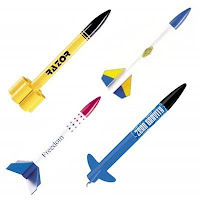 One of the best known and trusted manufacturers of flying model rockets is Estes, and we have a list of some their most popular Estesmodel rocket kits here. Not all of the Estes rocket kits we have listed contain absolutely everything you will need, so please check out the specifications, just in case you need to add engines, wadding, or a launch pad to your order. Building and launching model rockets is a safe hobby and there will be no risk of injury so long as you are sensible and you follow the basic safety guidelines. The best way to ensure your safety when you are flying model rocket is to check out the National Association of Rocketry Safety Guidelines. One of the great things about model rocketry is that hobby can grow as your knowledge and expertise grows. You can start out with a basic, all-inclusive model rocket kit, like those supplied by Estes, and then you can move on to designing and building your own rockets. You can build multi-stage rockets, build rockets with cameras in, and you can build rockets that go higher and higher. Model rocketry is a fun hobby that won’t cost you the earth. It’s also a hobby that has the potential to go on to much bigger and greater things. We hope that you found this beginner’s guide to model rockets useful. Please do check out our Model Rocket Store for all your model rocket supplies.